PRISM's metallic and industrial mineral permits and leases encompass approximately 1.91 million acres (776,322 hectares). Underlying a layer of glacial clay, a near-surface, flat-lying poly-metallic oolitic ironstone extends along the eastern flanks of the Clear Hills in NW Alberta. PRISM has diamond drilled and analyzed 230 diamond drill cores on its Clear Hills permits elevating the resource into NI 43-101 reporting compliance. In July 2012 a NI 43-101 technical resource report was released by SRK Consulting (Canada) Inc. incorporating drilling data from PRISM's 2008 and 2011 drilling programs. PRISM currently reports 557 million tonnes of indicated resource, with 182 million tonnes of contained iron and 2.45 billion pounds of contained vanadium pentoxide. Cobalt has also been recovered in preliminary carbonyl powder tests, and may be produced as a process by-product. Also noted in the NI 43-101 report, the deposit is open to the east, west, and south, and is associated with appreciable amounts of vanadium pentoxide. 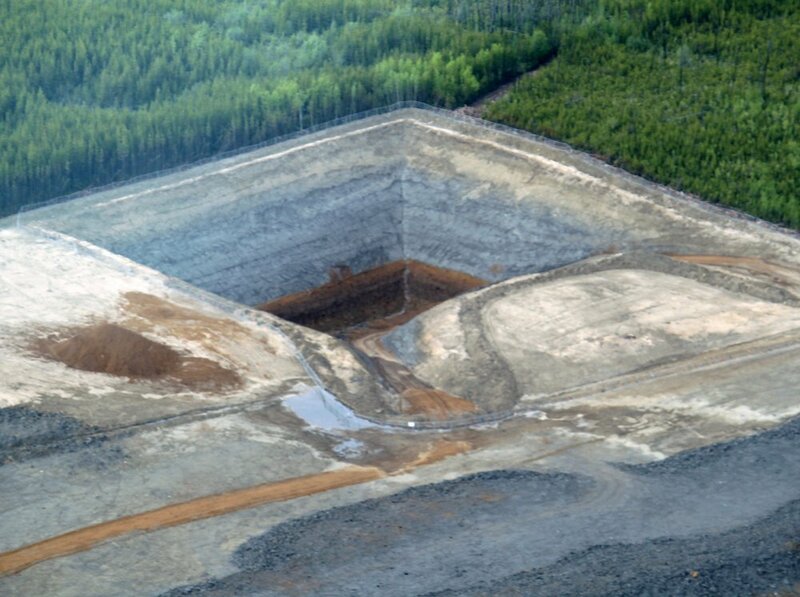 PRISM excavated a 45,000 tonne per year bulk sample pit on the Clear Hills "Rambling Creek Block". Approximately 11,000 tonnes of ore was extracted and stockpiled near Hines Creek, Alberta for ongoing process development at several North American pilot facilities. PRISM has the fortune of having relatively high concentrations of lithium in underlying carbonate reservoirs within its Clear Hills and Peace River Arch metallic and industrial mineral permits as evidenced by government formation water studies. These reports document anomalously high values of lithium and other performance elements (potassium, boron, bromine, magnesium, calcium, sodium and iodine) in Devonian-age aquifers associated with carbonate buildups in the Leduc Formation of the Woodbend Group and the Swan Hills Formation of the Beaverhill Lake Group. An underlying geologic structure, known as the Peace River Arch, has influenced the migration of lithium and associated performance elements into the porous brine-containing fringing reef formations. Acknowledging the large areal distribution of these fringing reefs, PRISM increased its permit holdings to 1.88 million acres (776,322 hectares) in the Clear Hills and region in early 2018. Most Devonian wells produce excessive amounts of formation water in comparison to petroleum products. In most cases, liquids pumped from typical wells will measure in the tens of millions of cubic metres, from which the oil and gas is separated with the brines injected back into the reservoir over the same length of time. The Devonian aquifers proximal to the Peace River Arch are situated at a prospective depth of 2,000 m, and the formation water is accessible via producing petroleum wells that pump the brine to surface. A non-compliant estimate for the total resource distribution for lithium in Alberta formation waters for the Woodbend and the Beaverhill Lake Devonian-age aquifers was performed by Hitchon et al. in 1995. The estimate of total lithium resource contained within Alberta’s Woodbend and Beaverhill Lake aquifers is potentially 515,000 tonnes of lithium over an area of 3,980 square kms, which represents a significant opportunity for PRISM, and Alberta, to become a major source of lithium for the expanding world market. PRISM published its maiden NI 43-101 technical report on the lithium-brine potential underlying its Clear Hills-Peace River Arch permits in April 2018. Subsequent geological and engineering evaluations in Q2 2019 will be undertaken to upgrade the technical report into a resource report. Extraction of lithium from oilfield brines is still at an early stage of commercial development. The success of PRISM's lithium project is dependent on the cooperative development of extraction technology that reliably and economically recovers lithium from the brine prior to further processing into lithium carbonate. PRISM has aligned itself with a company with particular expertise in process water extractive technology, and after planned optimizations and a demonstration pilot is conducted in mid-2019, a Preliminary Economic Assessment will be commissioned, followed by feasibility studies. The Clear Hills iron-vanadium deposit is overlain by expandable, bentonitic clays, measuring between 10 to 30 metres in thickness. These clays, and accompanying channel gravels, were deposited during the last ice-age as the ice retreated to the north. Clays of this type, due to their "bloating" nature, are amenable for use in the production of lightweight expandable clay aggregates (LECA) used in landscaping and hydroponics, as decorative stone products, and in a multitude of building materials. PRISM will also conduct further research and development of "carbonated" products, such as injecting captured CO2 into a mixture of iron (raw feedstock and process iron fines), process tailings and clay to produce "green" building products. The concentration and purification of bentonite may be also possible, and is an avenue of further research and development.